Harvesting the Veggies…A Day of Rest? Today, I excitedly went over to my friends garden. She has one of the most beautiful and abundant growing gardens I’ve ever seen. Everything is planted and grown with love and you can tell. It was a day off from canning and a chance to connect with where our food actually comes from and the work that goes into harvesting it. And, I am just talking about the harvesting here…let’s not forget about the planting, weeding, watering, picking throughout the season and the knowledge that is required to make it all work. It is a gift. I am still at the trial and error stage of growing food in my raised boxes so today was a wonderful opportunity to work in a producing garden with an expert. We started with the pumpkins. Unfortunately, last night we got our first frost…no time to waste. Let’s get them out of there! 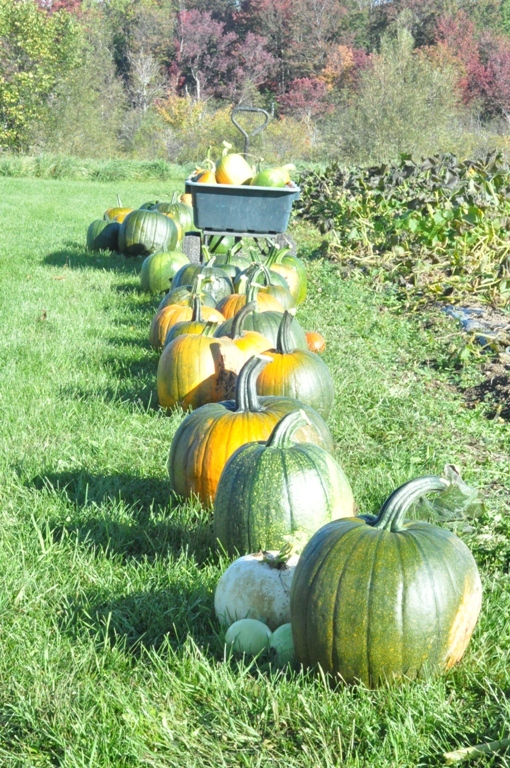 After we had picked and loaded the pumpkins we moved on to other tasks. 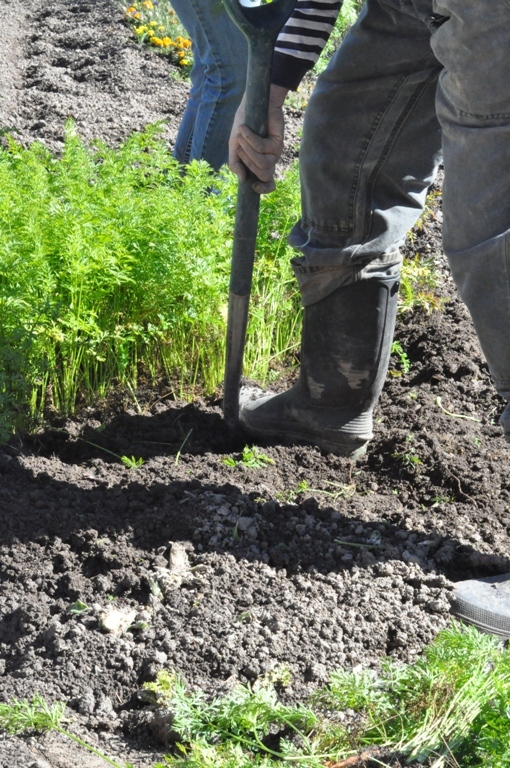 There are herbs to remove and beds to be tilled and garlic to be planted. Lots to do. The soil at Suzann’s place is so wonderful, a rich dark brown with a earthy smell, just perfect for growing so many delicious things. We picked peppers…hot peppers by the basket and green tomatoes by the box. I am going to enjoy trying a recipe for pickled green tiny tomatoes. In fact, just the other day I received this really interesting recipe for turning green baby tomatoes into an olivey tasting delight. MmmmMMMdelicious! And, for these hot little fellows to the right…well, I think they will go perfect in some of the salsas I’m making with the never ending supply of tomatillos. It is amazing what the right growing conditions will do for your plants. Sun…that is what we are missing here but Suzann has tons of sun. These peppers where just laddled on every plant. 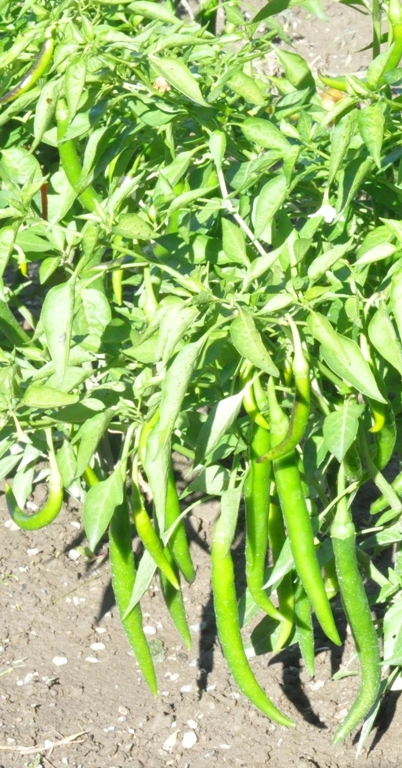 It’s hard to believe they could stand up straight with the weight of more than 30 peppers per plant pulling them down. What’s next? Fall raspberries. These late producing raspberry bushes are the best. And, the little red berries where plump and juicy. A real treat. 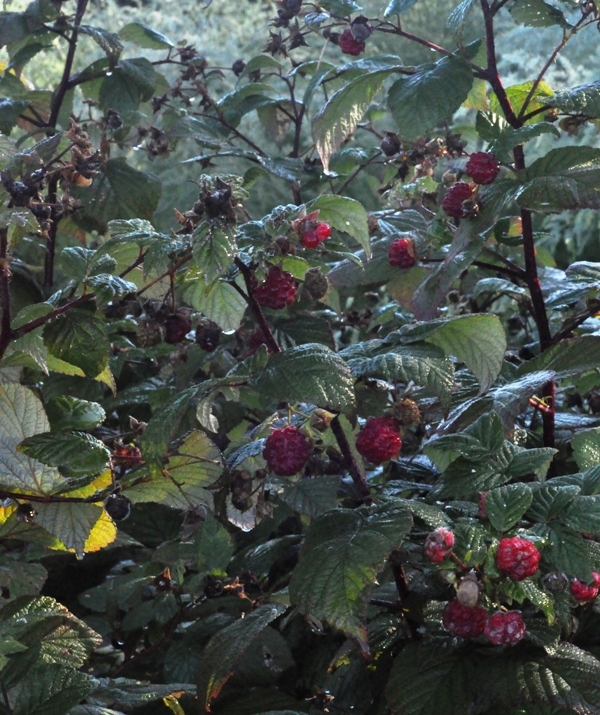 There is something special about being out on such a sunny, cool fall day picking raspberries. It was a peaceful experience with the changing forest leaves as your backdrop, tolling in the soil, harvesting the fruits of your labour and enjoying the company of a good friend. It doesn’t get better than this. 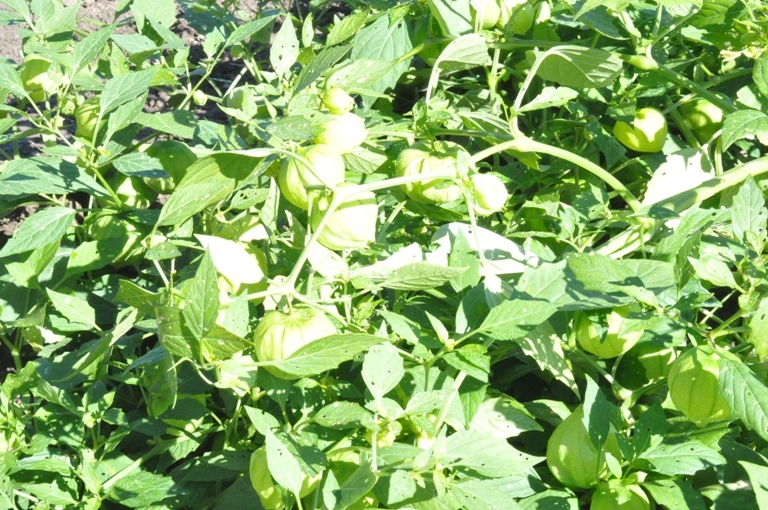 Off to the bed of tomatillos…yes, they are a weed and a delicious one. They grow in a large tangled mass and produce an endless about of packaged green little guys. I enjoy them so much that every once in a while I’d chew down one that was a little too split to keep but not bad enough to pass up. So so tasty! 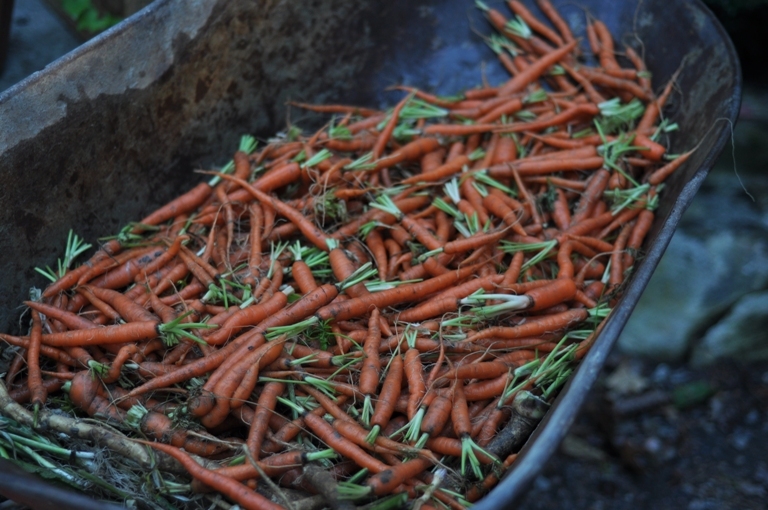 Last but certainly not least…CARROTS. As a child growing up I never really like carrots but last year after pickling them like cucumber dills I feel in love…true love. They are sweeter than dill pickles with a firm crunchy consistency that makes them a perfect pickled pleasure. I think we put up about 18 litres last year most of them regular flavour but a few had the added bite of hot peppers. They sure did become hot over time, too hot for me but perfect for Matt. I hope to put up as many as last year but only time will tell. 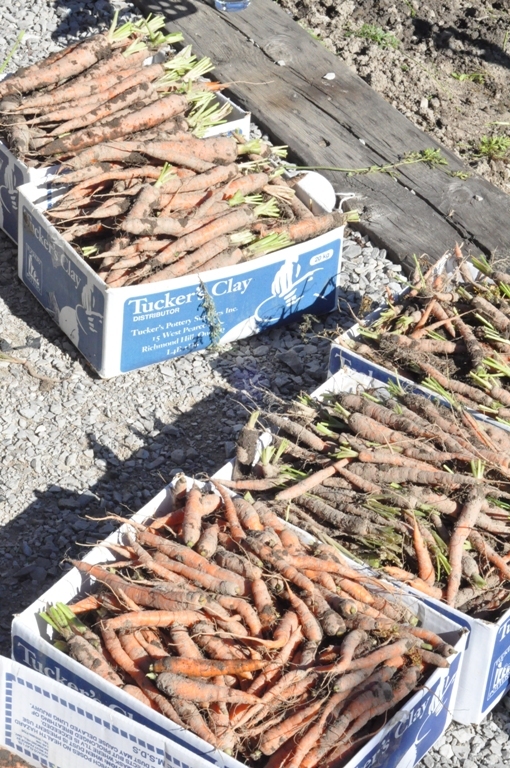 There sure were lots of carrots and alot of them the perfect size and length for those 500mL jars. 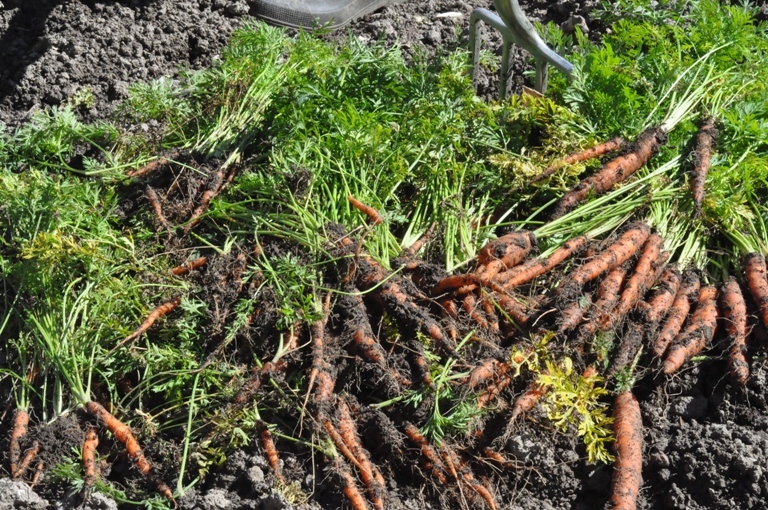 If you have a good sunny spot and grow carrots well don’t thin them out and you will get smaller carrots perfect for canning. Or, at least that has been our experience. 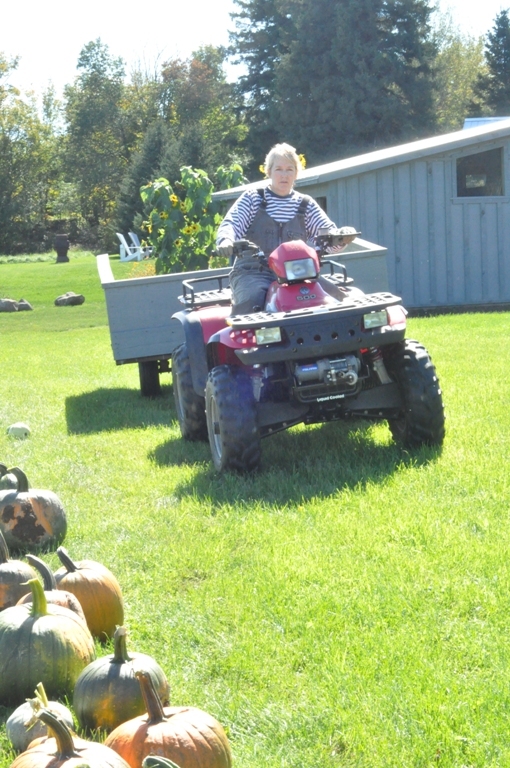 I’ve left a few things out here and there but that basically covers my day spent with Suzann tolling in the soil, harvesting her bountiful crop, preparing some of the beds for next year and enjoying the warmth of this amazing fall day. She still has lots to do and maybe I’ll get a chance to help again. So, the next time you go to the grocery store to pick up that bunch of carrots or that box of raspberries remember someone worked really hard to get them to you. I mean really hard. Today, I was fortunate to help with just a small part of the harvesting but Suzann works really hard for many many months to grow all this food while keeping her garden a beautiful show piece with many varieties of flowers as well. There is a wonderful sense of pride and accomplishment you feel when you grow what you eat. It’s not just magic but a lot of hard work. 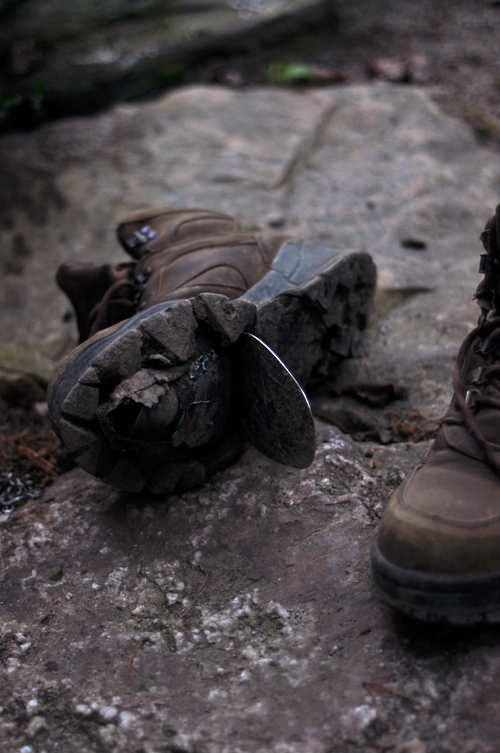 By the end of the day I was worn out and so were my boots. I should also mention that Suzann kindly provided me with boxes of carrots for my dill pickling, green tomatoes for olive making, fennel bulbs for something (not sure yet), horseradish root for making horseradish, lots of fiery hot green peppers a perfect partner for the tomatillos and a few leeks. Back to canning…no rest for the weary or is it wicked? 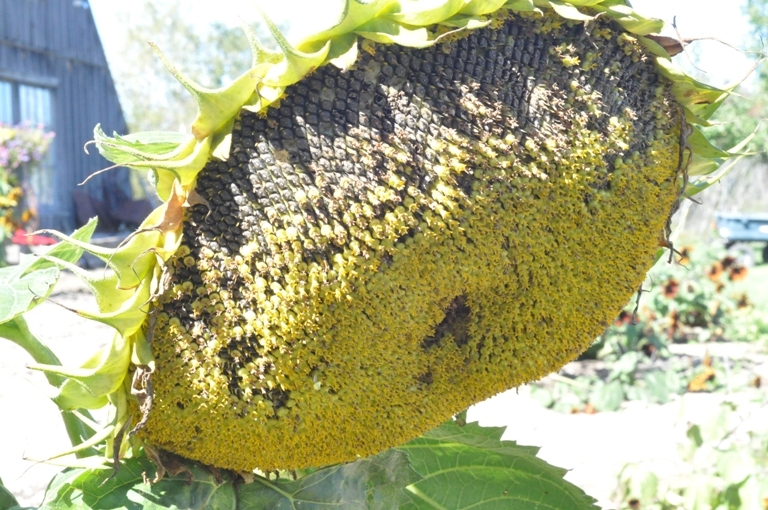 I just had to throw this picture in…the largest sunflower ever!?! You guys are awesome! Love the site…am going to try the jalapenos! Yums!